I have long been observing this product from afar, but for some reason I just never tried it yet until this year! I was missing out on a lot actually! 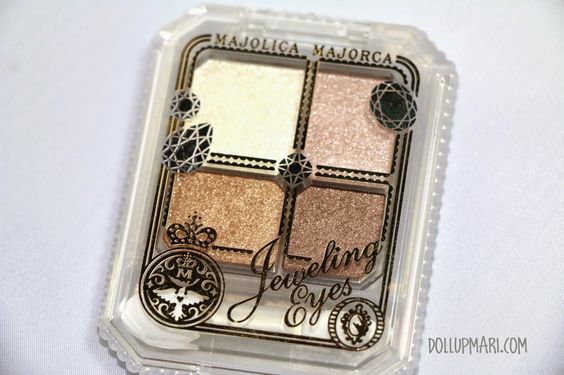 This is Majolica Majorca's Jeweling Eyes Eyeshadow Quad. in my previous posts about the brand you may have already read that this is a daughter company of Shiseido, but I'll just say it again. This is their lowest end brand (despite being high quality and relatively pricey), but meh, it's Shiseido we're talking about anyways. So let's get started with talking about this product! This is the quad. It's so cute isn't it? 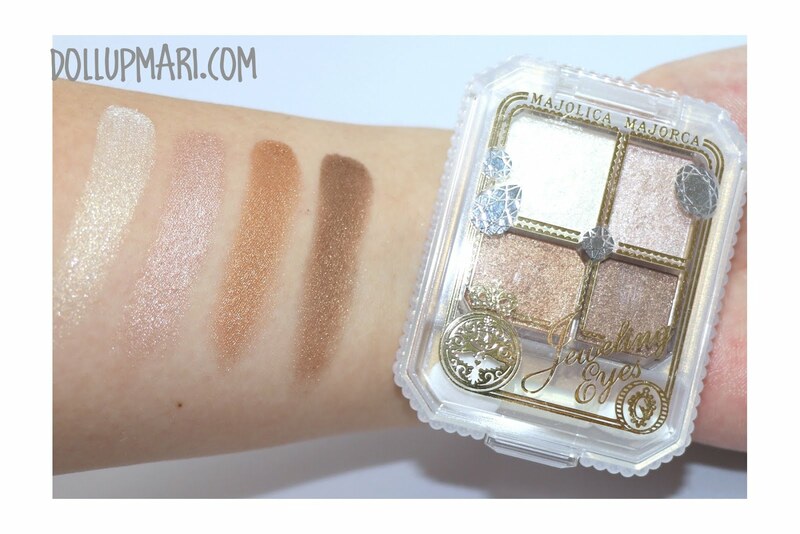 I remember a time when MM's eyeshadow quads had candies all over them, and I guess things have changed for the better as there are gems on the lid now! I do know that they have brown shades in other Jeweling eyes palettes, but this one is the most neutral one as it's the brown set. I also do know that there is a gold set, but the gold is a more conspicious gold. 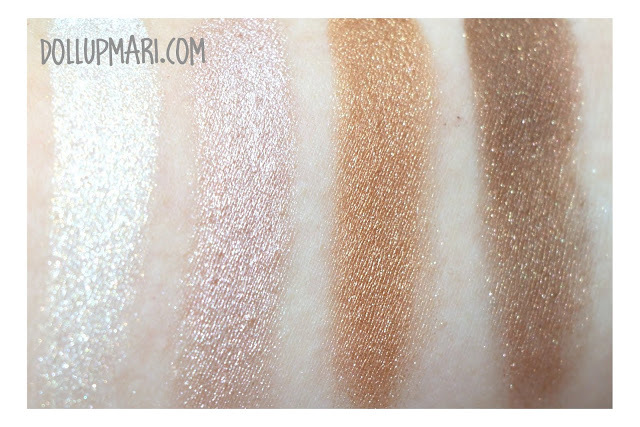 The gold one, nonetheless, is also a good choice for everyday makeup. This quad itself contains (left to right) a shimmery pearl white color, a light taupe brown, a copper brown and a deep bronzy brown. 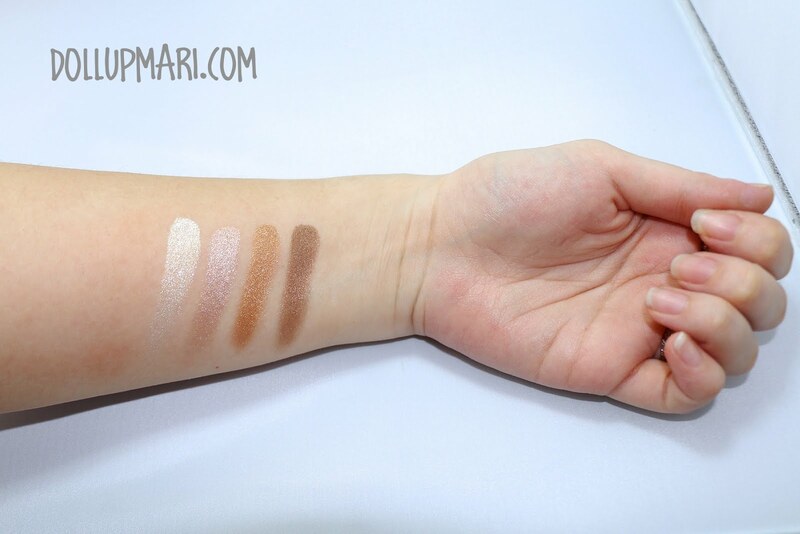 I know the bronzy brown looks like chocolate on the pan, but when swatched it looks more like a bronzy color. It also comes with a foam applicator. 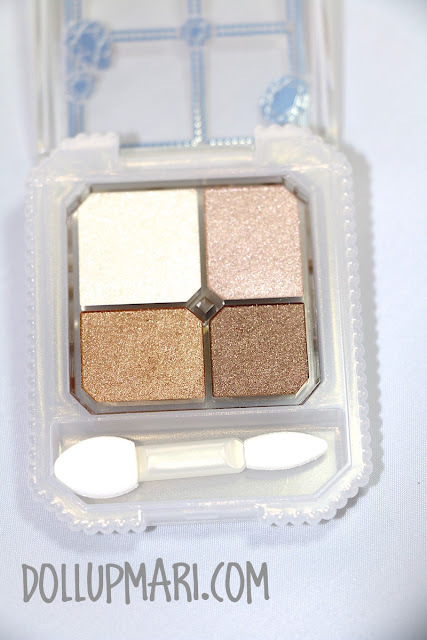 What impressed me the most about this quad is how pigmented the colors are. 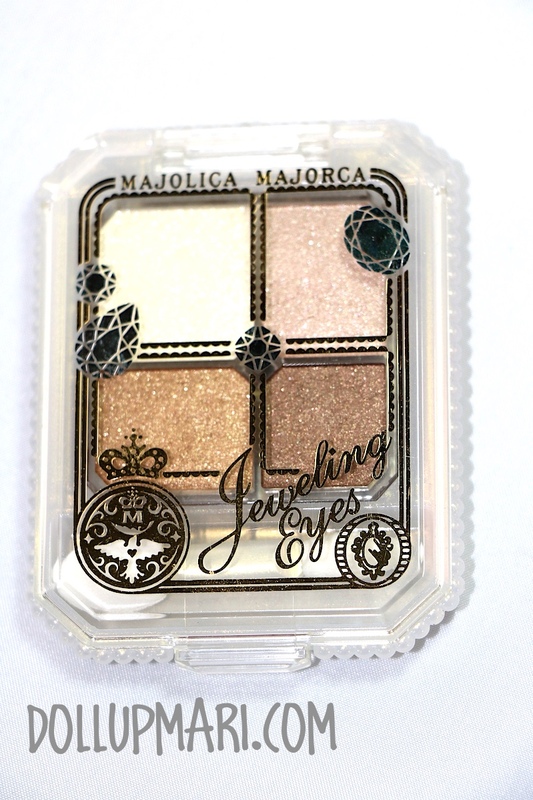 I was used to the usual Japanese eyeshadows that had a lot of shimmer and very little color opacity that I was in for a surprise when I swatched these eyeshadows! I was impressed that they were shimmery and were packed with microglitters yet buttery and very pigmented at the same time. And these are the uber gorgeous swatches of them! I love the colors! 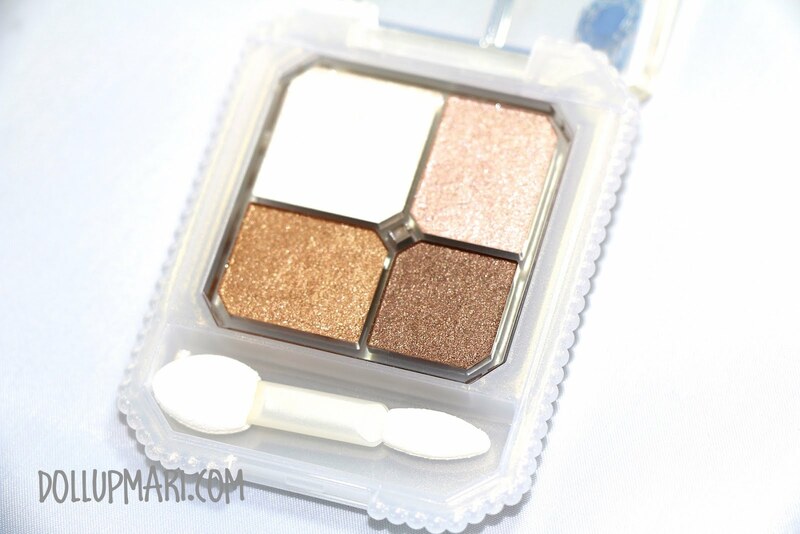 My favorite is the copper colored one, but in general, I loved the color combination in this palette! I just wished that the white one was smaller, or had a pearly texture instead, because at this rate it's too shimmery for a browbone highlight color. However, it's great to accentuate the tearduct area! To compare the swatches to what's on the pan, this is a good summary photo I have here. I got this for 380NT (about 625 pesos) from Taiwan. I know it's sold for 900 something here... For people who really like Japanese stuff and who are into this whole microglitter thing, this is a good purchase. This is also a good buy for people who want to buy products of Shiseido but find the Shiseido line itself too expensive to buy, this is a good way to feel classy without spending as much. 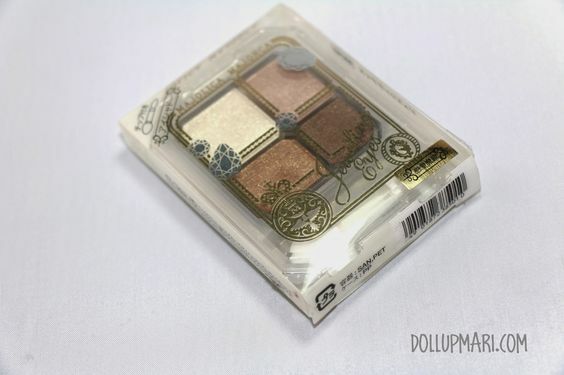 But I honestly think that the Philippine price is a bit too expensive for a quad, given how many other Japanese brands have eyeshadow quads of similar quality at cheaper prices. Given the Taiwanese price I bought it for though, I honestly do think that it's a good buy as this is what most other Japanese brands sell their quads for. Since I have quite a lot of eyeshadow quads already, I am not really eyeing on buying the rest of the shades in this collection, unless it's a purely purple quad. We shall see! 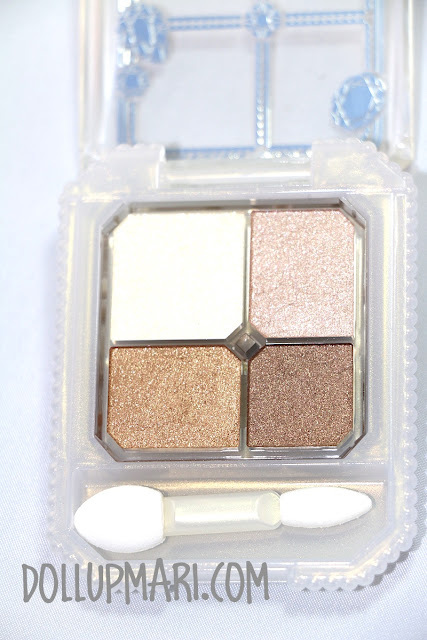 Have you ever noticed a difference between Japanese and Western eyeshadows? Please do tell me in the comments box!